The Tinker Metal Dice Kickstarter campaign is over, but there are miles to go before we sleep. One thing that we need to get cleaned up and sorted is the spreadsheet of who ordered what, and where to ship things to. To facilitate that, there are the Kickstarter surveys that I sent out, but there are a few oddments here and there, like forgotten shipping for those unfortunately expensive international orders, or people who wanted to add something on but just didn’t get there in time. Kickstarter doesn’t have a mechanism for this sort of last minute, post-project tinkering. Thankfully, PayPal will suffice. This is hooked up to my Project Khopesh PayPal business account, which is where the campaign funds will be going, so we keep it all together. So, for a little while, we’ll have this PayPal link to catch these last minute concerns. Also, since it has come up, we’re also going to allow last-minute orders for the next several days, until September 4th. So, please go check out the Kickstarter page for reference, since that’s the pricing and structure that we’re maintaining, including the limit of one “tier” and the add on limits of one of each Add On. I’m sorry, we’re offloading the research to you on this one, since we don’t have a proper storefront set up. This is a quick, short term fix. We are looking into longer term solutions, including an Etsy shop or something else, but that’s something we’ll do after we get all of this squared away. If you’re adding on to an existing pledge, please let us know your name over there so we can keep things together. If you’re doing something new, please let us know what dice designs and finishes you’re ordering, and what sort of bags you want and colors if relevant. Yes, this will mean a bit more work on our end, and we’ll be in touch with everyone who goes through PayPal to make sure we’re all squared away, but we think it’s worth it. Thank you everyone! This has been a wildly successful project, and we’re very grateful for your support! It’s the last 24 hours of the Tinker Metal Dice project, and we’re rolling out another last minute stretch goal. I know, I know, it’s yet another choice to keep track of, but we think it’s worth it. You all have been surprising, especially in these last few days, so it’s our turn to surprise you a little. We’ve also added two new pledge tiers to honor the last 24 hours of the project. Specifically, a tier for 24 Tinker Dice and another for 24 Gearpunk Dice. It’s been awesome so far, many thanks, everyone! Not a lot of time around here, but I wanted to comment on this while it is vaguely relevant. This TESO thing? Silly. Absolutely wrong for what Elder Scrolls games bring to the table, at least as far as I’m concerned. I played Morrowind for many hours, just noodling around, exploring the world and messing with things. Once I found a few mods, I did more tinkering. Sure, it could have been fun to have a good friend or family member in on the fun, but having a world full of other players with varied and often conflicting agendas, all screwing around? No, that’s not even close to the same experience. Sure, maybe TESO will leverage the interesting setting and lore and such, but that’s not what interests me in the Elder Scrolls games. No, the gameplay’s the thing, and dealing with random internet people and the static modless world that an MMO generally has to be really isn’t adding anything to the gameplay. It’s wrecking it. TESO is a totally different sort of game, by its nature, and that’s not a bad thing, exactly… but when there’s a very clear split between the setting and the gameplay as is necessary in this case, I firmly come down on the side of gameplay. Of course, EverQuest Next is playing around with terrain deformation a little bit, but again, that’s just griefer bait. I want to like it, I really do, but I just don’t trust people not to screw it up. If the solution is “the deformation goes away after a while”, we’re still just back to a weird sort of static world, it’s just a bit more pliable in the short term. Fun, in its own way, but really just another glaze of squishy paint on the theme park experience. What I’d have loved to see from both of them is their own spin on Minecraft servers. As in, let players control their own populations, connect to each other on a whim (even directly via IP address instead of through official channels or *gasp* even a LAN), stop screwing around with subscriptions, and go all in and let the worlds really be modded and molded. Sell the game via a one-time fee, maybe rent out server space for those who don’t want to run their own, and let players really go nuts, again, like Minecraft. Contain them to their own, small population worlds where it really doesn’t matter if Leggolass142 makes a Lord of The Rings Mt. Rushmore, because his friends approved of the project. That’s what I’d like to see as “innovation” in the MMO space. Not “Massively Multiplayer Online” games, but “Moldable Multiplayer Online” games, with small, private servers and a metric crapton of player agency. But then, I am a Minecraft fan. Many thanks to all of you for your backing on the Tinker Dice project! We’ve crossed through the $14,000 number! It’s all kind of crazy and surreal, humbling and flattering at the same time. I’m really glad that people are liking the designs, and I’m looking forward to getting them out to everyone. I didn’t have anything planned, but I did, on a whim, go ask some local jewelers if they could make solid or hollow 14 karat gold Gearpunk Dice. I’m pretty sure they thought I was kidding, since I haven’t heard back. I wasn’t… but then, it’s also highly unlikely that such dice would sell. Just like “plastic isn’t steampunk” (as cheerily noted by Kimberly Babb in the comments over here), gold seems a bit too… rich. Sure, it’s metal, and gold wouldn’t have been unknown to an alternate history steampunk era, but it seems to be that brass, bronze, and steel would have been far more common. Anyway, I tried. I’m sure someone, somewhere got a laugh out of it. If you’ve a minute and care about such things, please note your opinion below. We’re going to go with mob rule on this one; the finish with the most votes by midnight my time (UTC/GMT-7) Thursday the 22nd will be the one we produce as an alternate, so if you have a strong opinion, lobby for votes! If this seems like throwing you all to the democratic wolves… yes, yes it is. Let’s call it an experiment in rudimentary democracy. That’s steampunky, right? 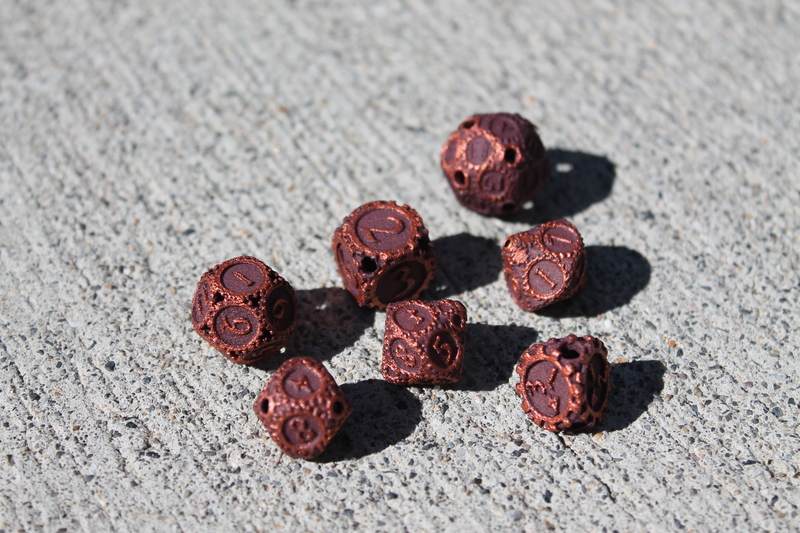 This alternate finish will be available in any pledge tier, for any dice but the Pentagear Fudge design. You won’t have to do anything special except let us know what finish you’d like on your dice, and we’ll ask that in the end-of-project surveys. As with the designs themselves, you can mix and match. This is even true on the SEEING DOUBLE tier, so you can use that tier as a sort of “super collector” tier if you want one die of each design and each finish (excepting the Pentagear Fudge, of course). Sample coins from the company making the Gearpunk Dice with relevant finishes… noting that these are coins, not dice… but it should give some idea of what the end result will be. The Tinker Metal Dice campaign is sort of winding down (it’s losing steam now that most of the stretch goals have been unlocked). There are still 11 days left, but it’s just not chugging along with the same head of steam that got it through the point where backers unlocked all of the Gearpunk gaming dice. That’s not a complaint, by the way, just an observation. I’ve been very grateful to see the positive reception it’s had so far. We’ve unlocked all of the Gearpunk dice designs, and might even get to one that I haven’t even prototyped yet, a Gearpunk Fudge die. Whatever happens, though, it’s been wildly successful as far as I’m concerned, and I’m looking forward to getting the dice made and shipped out to everyone. Oh, and speaking of Kickstarters winding down, please go check out Daft Dice! They do really good work, and their designs are sweet. Also, Mechanika, Empires of Blood and Steam, who we’re doing a cross-promotion with for some of their “Pentagear” Tinker-style dice. OK, so over 100 awesome people have blasted through the Tinker Dice base campaign funding goal and hit the first stretch goal in just a little more than 24 hours. As a result, we have before us a fantastic opportunity. 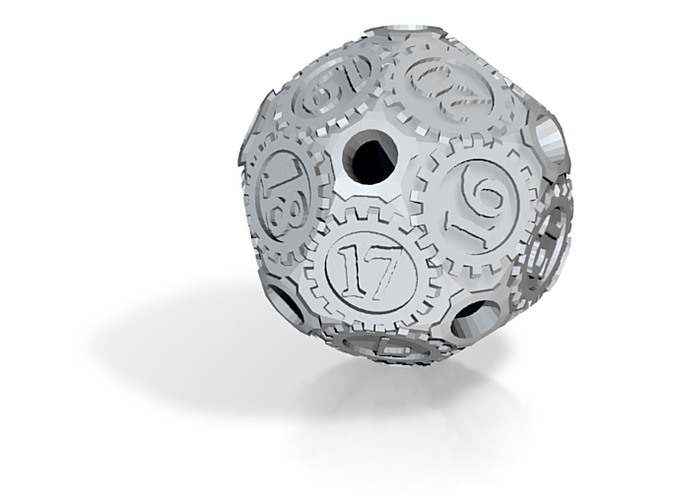 I’ve had my Gearpunk Dice available via Shapeways for a while now, but now, finally, we have the chance to make them in solid metal. I dreamed of this, but didn’t think it likely. So if you have the time, please go check out the Tinker Dice campaign on Kickstarter and please spread the word! 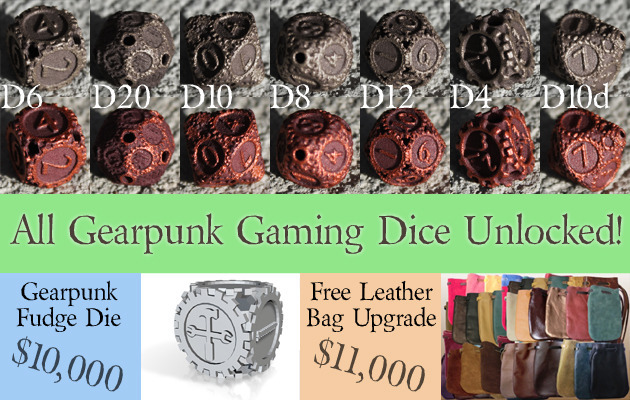 The more the merrier, and maybe we can make these Gearpunk dice happen! So, the metal Tinker Dice are funded, and we’re approaching the $2000 mark we need to get the Fudge/FATE dice made in addition to the standard numbered dice. Exciting times around here! Thank you again to everyone involved! Incidentally, here are a pair of articles on that “Fudge” dice thing and the FATE system, in case you were wondering what that’s all about. 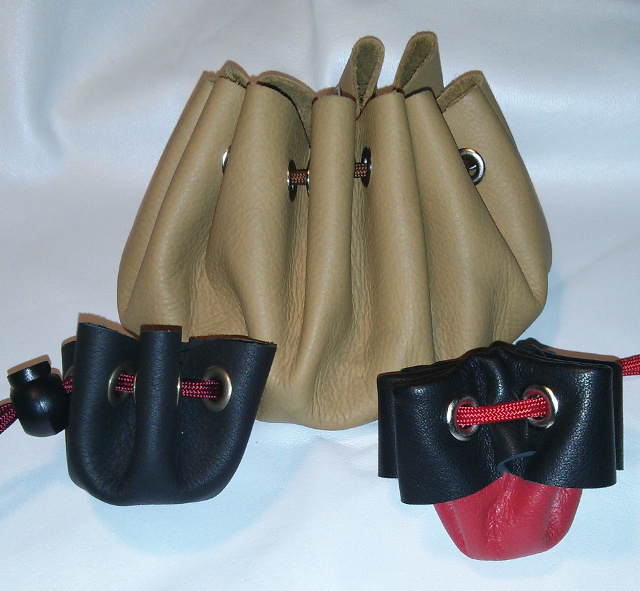 Customized Leather Dice Bags … the WWII designs might be especially relevant, if they unlock the stretch goal for those. It’s close, but doable. WarMachine Tactics … OK, technically, it’s a computer game. But it’s based on a tabletop game with miniatures and steampunky goodness. These would be a nice fit to a WarMachine collection… though you’d have to be careful not to hit the minis with the dice. Daft Dice are producing a variety of dice-related goodies, well worth checking out. I have one of their prototype wooden dice, and it’s a solid little piece of work. It’s the strangest die I own, but it’s pretty cool. Yeah, we can get these in solid metal. If we get enough interest. 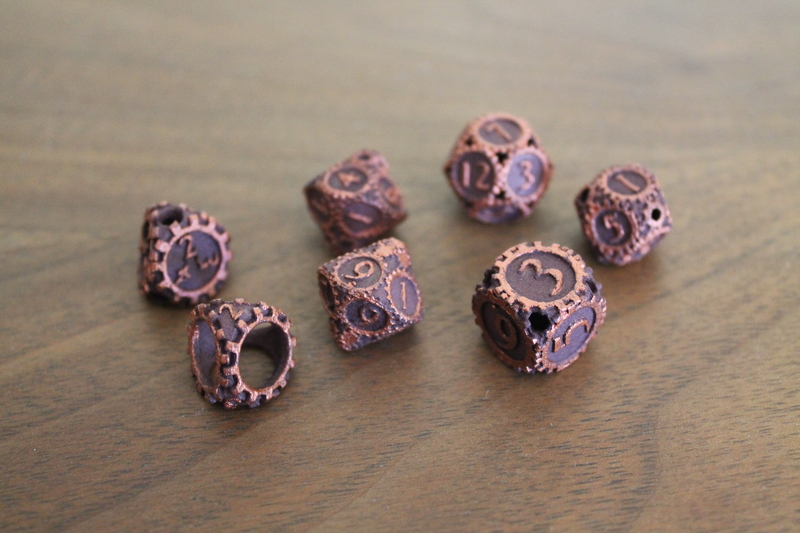 They won’t have these colors, since they will be solid zinc plated with antiqued bronze like the other dice, but the shapes should be as close as the mouldmakers can get them.